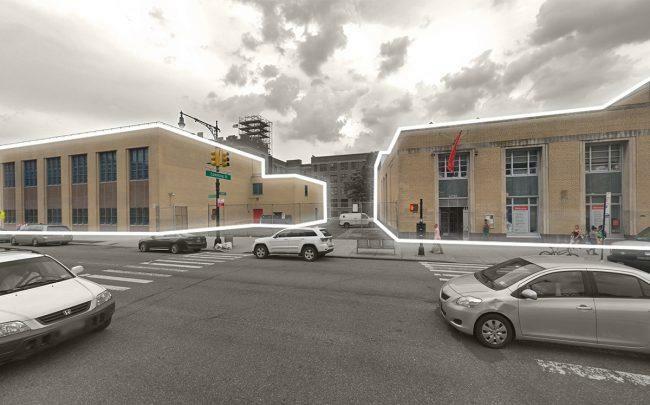 The city is planning a 174-unit affordable housing project at the Inwood Library site. The development at 4790 Broadway would span about 145,000 square feet and stand 14 stories and 143 feet tall, according to plans pre-filed with the Department of Buildings on Wednesday. The structure will be split between roughly 118,000 square feet of residential space and 26,000 square feet of community space. The city’s Department of Housing Preservation and Development, which filed the plans, did not immediately respond to a request for comment. HPD announced in early 2017 that it would partner with the Robin Hood Foundation and the New York Public Library to explore developing affordable housing at the site. The site will include a new library, and HPD and Robin Hood will secure funding for it. The City Council passed a rezoning plan for Inwood in August that aims to bring 5,000 housing units to the neighborhood. Maddd Equities and Joy Construction are planning to build a 30-story, 614-unit mixed-use project to the area at 3875 Ninth Avenue that will span 600,000 square feet.